Berringa™ Super Manuka Honey contains a naturally occurring compound known as Methylglyoxal (or MGO). This MGO has been scientifically shown to contribute to the antibacterial and antimicrobial activity and associated health benefits. Rich and delicious, this honey comes from pristine coastal areas on the Eastern seaboard of Australia. 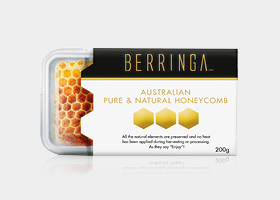 Berringa™ Pure & Natural Honeycomb is a delicious combination of 100% Australian eucalyptus honey and honeycomb. Not only is honeycomb delightful to look at, it can also be enjoyed as a delicious treat or given as a unique gift. Serving suggestions include cheese and antipasto platters or enjoyed the same way you would honey from a jar. Berringa™ Pure & Natural Honeycomb is packed in an airtight, leak proof sealed tub.